“Righteous Kill” Great Duo + Lousy Movie = Lousy Movie | Phil-zine! Long time partners have an amusing conversation. 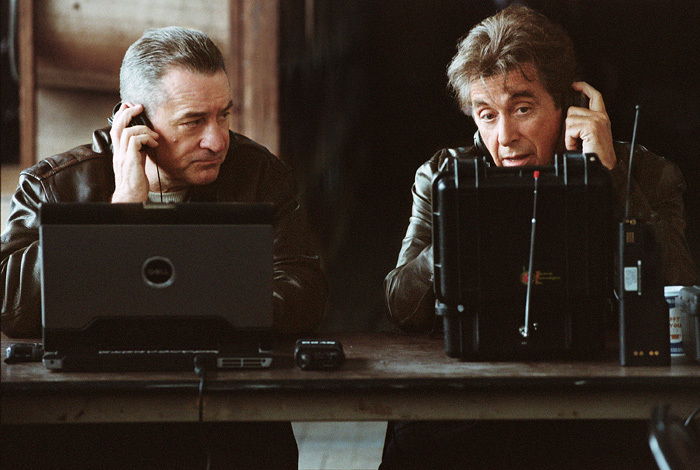 The performances in Righteous Kill are so nuanced that the already weak story becomes that much more transparent. Robert De Niro and Al Pacino play police partners who are on the trail of a serial killer that’s killing bad guys whom they believe is one of their own. At one point a psychologist says, “A serial killer cop, never heard of such a thing.” Guess he hasn’t seen Dexter. After thirty years on the force, the two detectives, can finish each others sentences, but a psychological rift is created as they get closer to the killer. What transpires is supposed to be a mystery, but unless you’ve never seen a movie before you’ll know what the director, Jon Avnet, and screenwriter are up to long before they show their final card. The first five minutes tells you all you need to know about these characters in the most hamfisted way possible. Ones a brute, the others a thinker, and they both giggle like school girls when they shoot guns. The rest of the movie is just as incompetent in the storytelling. In fact it’s really kind of boring. The fortunate thing is that De Niro and Pacino are enjoying themselves so much, you can’t help but enjoy it a little too. The next time they do something together it should be a comedy. They’re having fun! And Pacino plays coy and subtle, the way I like him — with a glint in his eye. Donnie Walberg and John Leguizamo are both actors I really like and are both under used. Thankfully Carla Gugino is not underused. And rapper Curtis Jackson, as a thug does some above average work. Did I say the performances were nuance? Well, about half way through the direction and lighting becomes so heavy handed that you know misdirection is what they’re going for. So it’s nice that the writer, Russell Gerwitz, walks on the side of psychology rather than let everything hinge on the supposed twist ending in which we’re given flashbacks of scenes that I guess we aren’t supposed to know happened the way they did, but we do. This entry was posted on September 17, 2008 at 10:49 pm and is filed under Current Movies and Reviews. You can follow any responses to this entry through the RSS 2.0 feed. You can leave a response, or trackback from your own site.